Portsmouth’s anger at the proposed siting of a giant incinerator spilt on to city streets. 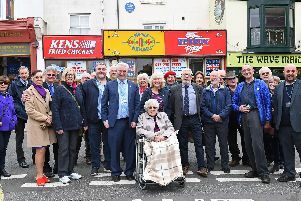 More than 150 committed Ban The Burner campaigners marched a three-mile route from the proposed site in Quartremaine Road, Copnor, to Guildhall Square in a display of public defiance. The chairman of the Ban The Burner campaign Sarah Fry with some protests sent to The News Centre. Later, Ban The Burner campaign leaders travelled to Winchester to hand county councillors and Dudley Keep, the county’s planning committee chairman, a 22,000-name petition. Leading the Ban The Burner campaign march were Tory lord mayor Brian Read, Labour council leader Alan Burnett, Liberal Democrat planning chairman Mike Hancock and councillors in whose Copnor ward the plant would be built. Cllr Hancock said: ‘It’s a splendid demonstration of whole-hearted support from the people of Portsmouth. It’s a clear indication of public determination to stop this outrageous scheme. Meanwhile, letters had poured into The News Centre, Hilsea, outlining why the controversial £105m burner should not be built in Quartremaine Road. Winifred Hoar, of Hilsea, said: ‘One of the most breathtaking sights of the city is from the top of Portsdown Hill. Campaigners won the day, but around a decade later a smaller, more energy-efficient version was built in the same area.